Maureen Ramaube (25), junior lecturer for the foundation programme at the Tshwane University of Technology’s (TUT) Department of Engineering, has been selected as TUT’s new campus ambassador for SAWomEng. 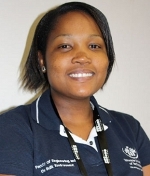 South African Women in Engineering (SAWomEng), has selected campus ambassadors who will represent the student’s organisation from different universities countrywide for 2013. This came after their annual conference that was held in Cape Town and Durban earlier last year. As a campus ambassador, Ramaube will have a vital role to represent and be the face of SAWomEng. Maureen will assist students, especially females, with any problems related to the field of engineering and also act as a mentor. The organisation supports female tertiary students in an effort to encourage them to remain in the engineering industry. This is done through the SAWomEng conference held annually, which entails workshops, information sessions, mentorship sessions and team building activities. “The conference is a cornerstone of information and knowledge for students in the respective engineering field. It brings us together and afford us opportunities to interact with students from other universities and major female role players from the industry,” said Ramaube. Since 2005, SAWomEng has run national conferences, bringing the top female engineering students from around South Africa together to tackle social and engineering problems. “My application to be considered the campus ambassador for the University was significantly influenced by lack of information among students. This opportunity will help me to disseminate relevant information to students. It will include motivational talks during information sessions that will commence this year, to encourage females to stay on in the field since there is an immeasurable need for females in the engineering sector,” added Ramaube. In the year 2011, Ramaube was part of the Mercedes South Africa graduates programme and joined the University last year as a junior lecturer.